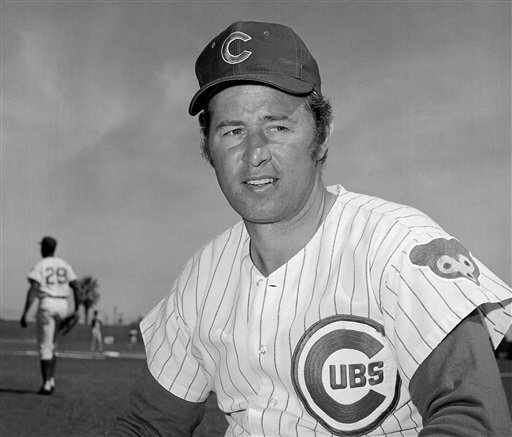 Soon-to-be Baseball Hall of Fame inductee Ron Santo in 1971. 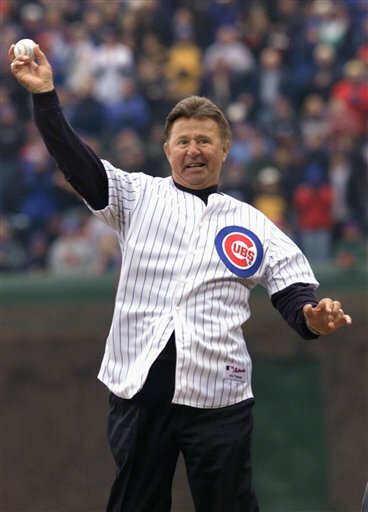 Ron Santo throws out the first pitch at Wrigley Field on April15, 2002. This has been a long time coming: After years — and years — of waiting, Ron Santo will finally be inducted into baseball’s Hall of Fame Sunday. Most fans younger than 40 never saw Santo play; they just remember him as the humorous, lovable color commentator in the radio booth. But the many fans who watched Santo play third base day in and day out know what a tough and clutch player he was on the field. Sadly, Santo will not be there to get a slap on the back from his fellow Hall of Famers, enjoy warm embraces from family and friends or hear the roaring excitement from his countless fans; the Cubs third baseman lost his battle with bladder cancer on December 3, 2010 and will enter the hall posthumously. “He wanted to be part of that pantheon of those great players — I’m glad to say he is,” said Hughes. Wrigley Field has a Ron Santo statue and his #10 retired on a waving flag. Now Cooperstown will have him in the Hall of Fame. If only it had happened sooner.